Our aim is to provide excellent, person-centred and compassionate care to every resident. With an expert team covering residential, nursing and dementia care, Cherry Blossom Care Home in Peterborough has on-site care that few other care homes can rival. We work with every resident and their families to tailor a care plan to the individual needs of that person. Each and every resident has differing needs. That’s why we invite potential residents to visit us, not only to see the extensive facilities we offer but for us to best assess the residents’ needs. We are dedicated to creating an atmosphere of care and choice which enables and encourages our residents to live a full, interesting and independent lifestyle, in a luxurious and safe environment. Our residential service is an all-inclusive lifestyle in which residents are free to take advantage of every facility Cherry Blossom has to offer. From our luxurious bedroom suites, to lounges, our cinema, Barnaby’s Bistro & Bar, private dining facilities for friends and family, The Dove Beauty Salon, a chauffeur driven limousine for special occasions, regular activities and events such as music evenings arranged by our events manager, there really is something for everyone. This really is a home for all residents to proud of, making your stay with us rewarding and a pleasure. And you will never be on your own – we operate an open visiting policy in order that residents can receive friends and family at any time, as they would if living in the wider community. There is no requirement to make an appointment when visiting your relative, just turn up and we would be happy to accommodate you. 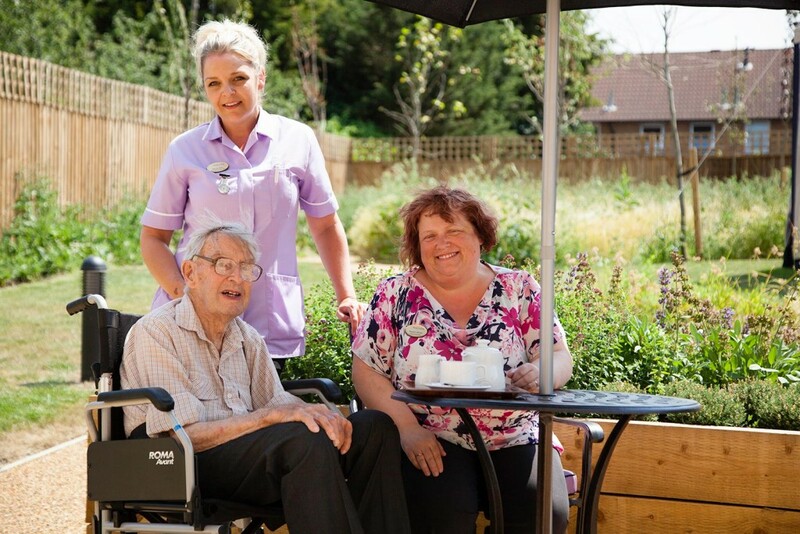 Residents enjoy the kind of independence they desire whilst having peace-of-mind, knowing that 24 hour care is available to provide the help and support they may need at any time. Nursing staff are on hand 24 hours a day to provide person centred care. The Qualified nurses will ensure that the care staff offer unobtrusive assistance as we hold a great deal of importance on the need for privacy and dignity of our residents. Comprehensive and ongoing training of all our staff ensures that the care delivered follows a number of care pathways to meet their individual’s needs. The staff ‘s level of professionalism provides respite, Nursing and continuing care to the physically frail or those suffering from chronic illness ensuring quality of life while resident at Cherry Blossom Care Home. At Cherry Blossom Care Home residents benefit from having qualified nurses on site 24 hours a day, whilst also enjoying the comfort of living in a non-instituted and luxuriously-appointed environment. As well as first class residential and nursing care, at Cherry Blossom we offer the best in contemporary practice for caring for people with dementia, including Alzheimer’s. Our staff are specially trained to help manage the unique needs of residents suffering from varying degrees of dementia and at all times ensuring our care delivery remains person-centred. Residents receive high levels of attention and supervision and care is highly individualised, based on the resident’s needs and wishes. Cherry Blossom Care Home specialises in innovative dementia care which enables every resident to live independently in an environment designed to enrich their lives. We believe enabling residents to maintain positive connections with their families and friends which gives their families the knowledge that their loved one is happy and safe. The staff are carefully selected with previous experience in dementia care and they attend extensive training provided by the company empowering them with knowledge and a positive attitude to personalised care. Our staff are very aware of the need to have insight into the resident’s life history and by incorporating the information into the residents care plan enables them to maintain a person centred approach which has been guided by the resident their family and friends. Care involves you arriving from your home in the morning at 9.30 am lunch and afternoon tea before you leave at 3.30 pm. Food prepared at Cherry Blossom day centre is prepared in a modern kitchen to a high standard there is a choice of menu which will cater for all client needs incorporating hot and cold choices and special dietary requirements will also be catered for such as diabetic diet low fat diet fortified diet. You can enjoy the gardens, and join in our activities as much or as little as you want to. Facilities at Cherry Blossom Care Home are available for a single daily fee. We also offer Respite Care for people whose loved ones require a slightly longer break from caring for them. All our residents, whether residential, nursing respite or day-care are offered the full benefits of the whole home, together with our exceptional care.